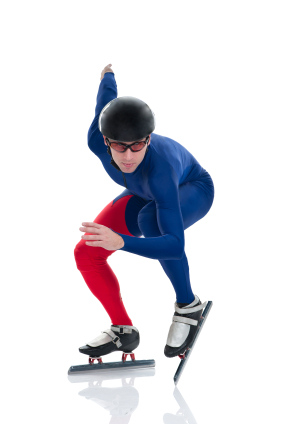 Researchers at Korea University College of Medicine (Park et al, 2012) recently conducted a neural imaging study of elite speed skaters to investigate whether training of complex motor skills resulted in structural changes to the cerebellum. The cerebellum responds to intense, repetitive training with increased brain mass in areas critical for skilled motor movement, in this case for control of balance, precisely coordinated movement, and visually guided movement. The authors compared the cerebellums of professional speed skaters to individuals who did not engage in regular exercise. They found that the specific skills required for speed skating that were trained repetitively resulted in structural changes to the brain that enhanced balance and coordination. They also found that the particular side of the cerebellum that was exercised repeatedly was affected (i.e., the right side due to maintaining balance on the right foot during turns). Of note, the cerebellum is also a central part of the brain’s internal timing network. The timing and synchronization of neural signals ultimately controls balance and coordination. 1) Repetitive practice of the specific movement. 2) Motivating exercises to help us stick to it and keep working toward our goals. 3) Emphasis on making us think about the quality of our movement (or what we call cognitive engagement). 4) Somatosensory, auditory, and visual feedback about how we are moving, coordinating, and balancing our limbs to help our brain connect with our body and get into sync. 5) Information about how well-timed & synchronized our movements are each time we move in the form of a millisecond score, allowing us to make adjustments as we go to continuously strive for improvement each time we move. Springer Science+Business Media (2012, March 26). Skaters' brains: Specialized training of complex motor skills may induce sports-specific structural changes in cerebellum. Retrieved March 27, 2012, from http://www.sciencedaily.com¬ /releases/2012/03/120326112918.htm#. For more information on Interactive Metronome visit: www.interactivemetronome.com or call 877-994-6776.